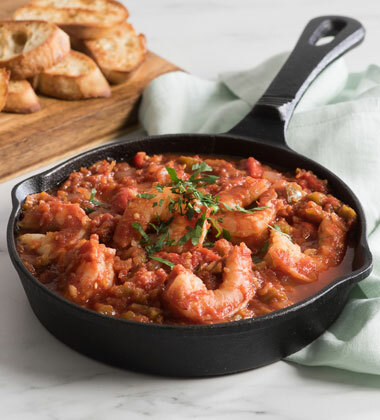 This fragrant skillet appetizer feeds a crowd easily, marrying sweet shrimp with tangy salsa, and plenty of sauce for dunking toasted bread. 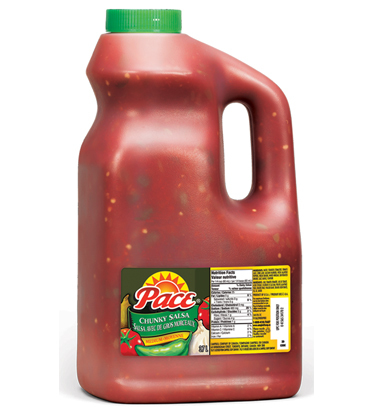 A hearty, premium salsa. Ideal as a dip, topping, or garnish. Mild. Packed 2 jugs to a case. 1. Lemon Saffron Mayonnaise: Stir together hot water, saffron and garlic; let cool slightly. 2. In bowl, whisk together mayonnaise, lemon zest and lemon juice. Stir in saffron mixture until well combined. Refrigerate until ready to use. 3. Heat 1/3 cup (75 mL) oil in large skillet set over medium-high heat; sauté shrimp, red peppers and garlic for about 2 minutes or until shrimp begins to turn pink. Remove shrimp from pan. 4. Add salsa; bring to boil. Reduce heat to simmer; cook for 10 to 15 minutes or until slightly thickened. 5. Meanwhile, preheat oven to 400°F (200°C). Lay baguette slices in single layer on large baking sheet; brush with remaining olive oil. Bake for 10 to 12 minutes or until crisp and browned. 6. Return shrimp to skillet; heat for 1 minute. Sprinkle with parsley. Drizzle with Lemon Saffron Mayonnaise and serve with toasted baguette slices.